Exeter’s citizens demonstrate how they want to be part of the solution ! On Saturday 21st November, 230 people attended the Alternatiba Festival, held in Exeter. Over thirty different community groups and organisations came together to share stories and experiences of how we can live in a more sustainable way and enjoy being part of a rich and diverse community. The festival included talks by Rupert Read and 15 different community groups. There were food stalls and an alternative xmas market where people could buy locally produced crafts and foods. People attending were able to purchase Exeter Pounds as xmas presents, buy shares in Exeter Community Energy and find out about the new West Town Farm Community Trust. Cycling is part of the solution ! Cyclists joined Alternatiba Exeter’s cycle parade though Exeter on Saturday the 31st of October. Cycling with colourful flags representing the beauty of our natural world they were raising awareness about the Alternatiba Festival which is happening on the 21st November and the importance of the climate change talks happening in Paris later this year. Climate change is having huge implications on many societies across the world, through rising sea levels and increases in disastrous weather – it is one of the biggest challenges of our time. On 30th November 2015, countries deemed as major carbon emitters will meet in Paris for COP21 to come to an agreement on reducing those carbon emissions. The world over, people are finding ways to put pressure on their political representatives to come to a realistic deal at these talks and try to curb runaway climate change and save the human race from causing its own extinction. Alternatiba Exeter is a celebratory day-long festival on 21st November which shows participants various alternative ways of living – and showcases specific Exeter-based groups and businesses which are already leading the way to changing our day-to-day lives to compensate for climate change. The festival will take place at various venues across Exeter, weaving a “village of alternatives” into the fabric of the city. Venues include: the Corn Exchange, St Stephen’s Church and Southernhay URC Church. At the Southern URC Hall there will an alternative xmas market with local goods. Everyone can contribute to reducing our carbon footprint by simple decisions, such as what they buy. Buying local produce not all reduces your carbon footprint it also supports the local economy and builds community. Alternatiba member Gillian Baker urges everyone to pop by to buy at least one christmas present from the Alternatiba Festival to show their commitment to a more sustainable Exeter. There will also be opportunities to get involved in community initiatives from becoming a member of an organic farm community trust to investing in community solar. ‘Alternatiba’ is an international network of festivals showcasing practical alternative solutions to the global crisis. The first one was held two years ago in Bayonne in the South-East of France and there are now more than a 100 of Alternatibas across the world. Alternatiba Exeter is the second one to be held in the UK after Todmorden in Yorkshire. Visit alternatiba.eu/en to find out more about the movement. The preliminary programme is available here !! Would you like a stall or to give a talk to promote your community group/sell local gifts/food? What do we need the money from this crowd funding for? We are entirely run by this crowd funding campaign and donations. We are independant of any political party. We need money to invite the speakers (journey+meal), the artists, to hire the venues and the equipment (projectors, microphones, speakers, …), to make the publicity (with leaflets, posters, badges) and the equipment for volunteers. You can support us here ! On saturday 17th of October, we had a stall at Embercombe’s Pizza, Apple & Pumpkin Day ! There were lots of family-friendly activities including traditional games and crafts, wild wood shelter building and tree swinging, fire making, porridge jousting and apple pressing. A very nice place to promote Alternatiba ! Alternatiba Exeter on AVAAZ ! Alternatiba Exeter is part of the Global Climate March : sign-up and share here ! On Saturday the 3rd we were on High Street (in front of Boots) with the Frieds of the Earth, the Food Fight, the knit project and Exeter young greens to support the Divest Exeter campaign ! We were able to speak with some passer-bys and make them sign the divest petitions. We also advertised Alternatiba by distributing some leaflets about the event. More info on the Divest Exeter campaign : here. 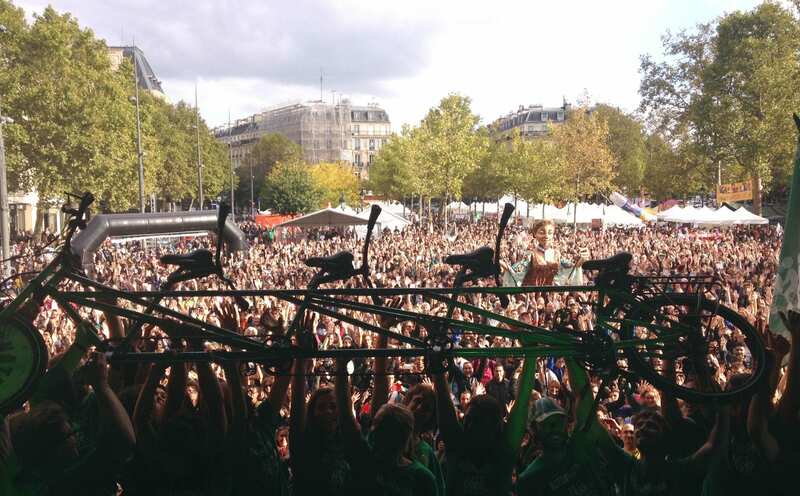 The Alternatiba tour arrived in Paris! After an impressive trek of 5600 km, 187 stages across 6 countries, Alternitiba arrived in Paris on Saturday, September 26th. More than 1500 cyclists (20000 people in total!) welcomed the participants of the Alternatiba Tour in Paris. On Sunday a big festival was organized with stalls, speakers and artists to promote all kinds of solutions to the global crisis. During their journey, more 60000 people join the cyclists on their tandem with 3 or 4 places. 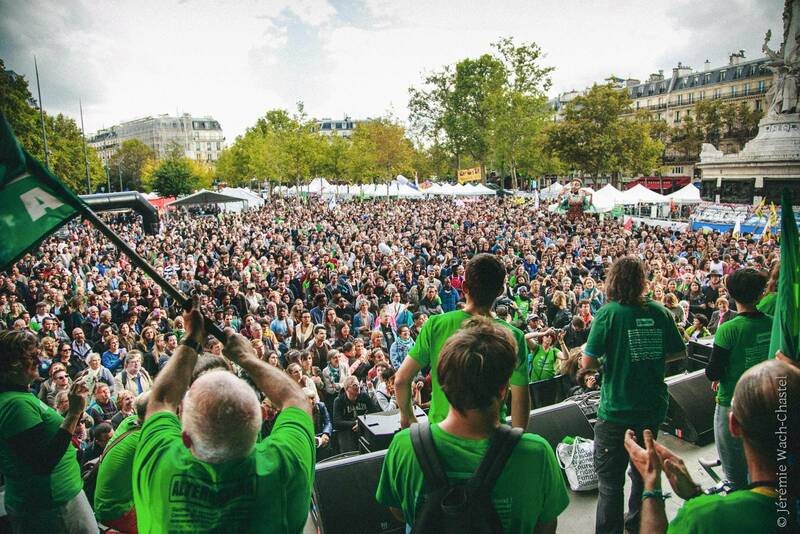 Since the begining of the movement more than 320000 people has participated to an Alternatiba festival accross Europe. We can not wait to make ours here in Exeter! On the 27th of September, Myriam joined the Exeter Green Walk to Riverside Park. Exeter Green walks is a project in association with Transition Exeter. It’s a very good way to meet new people, share ideas while enjoying a leisurely stroll around the many gorgeous green spaces of Exeter! It takes place on the last Sunday of every month, starting at 2pm and meeting just outside Exeter Cathedral.